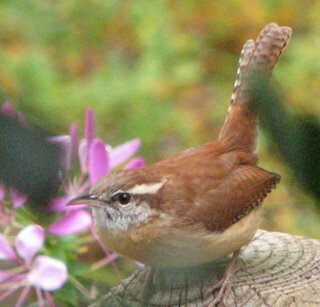 The Carolina Wren is a year round resident in New Hanover and surrounding counties. 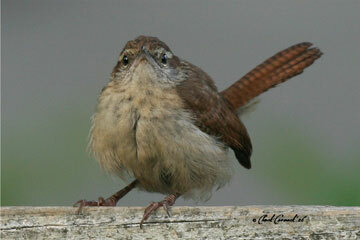 It can be distinguished by it's small size, rufous brown color, and long bold white "eyebrow". Males and females look similar. It is easy to identify this bird by song or call before it is even seen. It is quite a songster, and despite it not being as colorful as some other birds in the area, many people love to have this bird in their backyards for its varied cheerful sounds. This bird is common in urban areas and forested areas. It nests in cavities in trees or will use nest boxes as well. At Wild Bird & Garden we sell nest boxes especially for this species [link]. Carolina Wrens are insectivores, meaning they only eat insects. At Wild Bird & Garden, we sell mealworms (dried and live) as well as insect flavored suet cakes [link].